Rumors for a Canon 1Ds Mark IV have been heating up recently. Speculation kicked up a notch or two over the weekend after the Canon 1Ds Mark III reportedly disappeared from the Canon Canada site. The 1Ds Mark III, however, has been placed back on Canon Canada’s website for now. It’s still “temporarily unavailable” from B&H though. The 1Ds Mark III was introduced in August 2007. Previously, Canon has gone on record to state that there is a 3-year life cycle for Canon pro-level DSLRs, which means the 1Ds Mark III is past due for a replacement. 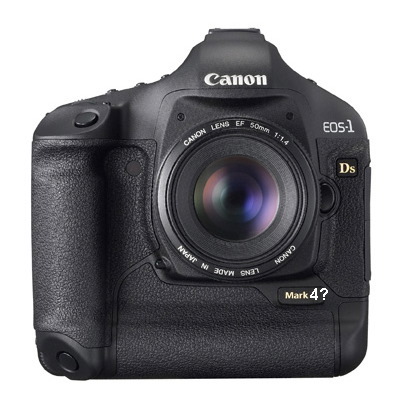 Additionally, the 5D Mark II was introduced in September 2008, which puts it on schedule for replacement as well. If a 1Ds Mark IV were to be introduced in the months ahead, I think it would be an odd proposition to expect a 5D Mark III at or around the same time. Feel free to pass along your speculation or third-hand knowledge on Canon’s next big full-frame camera below. I am not interested really in the top 1D group, but new 5D may be my next DSLR. If Canon think about me (haha…) should make a very nice work with the 5DIII. I am thinking to return to Nikon, if the D800 shapness is very similar to that of 5D. I love my 5D classic and I like the Mark 2, but the focus in hard light conditions… hmmm…, it should be BETTER (and I hate so much that stupid position of the on/off button!!!!!!!!!!!!!!!). It would be my view that if Canon does not introduce a new Pro Camera within the next month or so many individuals like myself who have been waiting for a professional full frame Canon DSLR will leave the Canon environment for an alternate product. I have been a Canon user for 15 plus years and frankly am tired of delaying my photographic endeavors in hopes Canon will release a new professional camera. I do not consider the 5D Mark II to be a professional camera, the styling, feel and design of such things as the eyepiece (so close to camera body it places your face on the 3″ display etc.) makes it unacceptable to me. Hopefully a product will be introduced that is acceptable and priced at an affordable/competitive level, as I would prefer to continue my relationship with Canon. Canon’s refusal to provide loyal customers with an indication of what to expect is discourteous and insulting for thousands of users who need to make business decisions relative to their future investment in photographic upgrades.